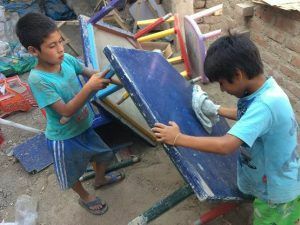 San Borja is a neighbourhood of approximately 200 families living in abject poverty on the outskirts of the coastal city of Chiclayo. Housing is adobe, without electricity, proper sewage disposal or running water. Potable water is available only one or two hours a day from a community tap. During the past four years, with accompaniment by our partner Centro Esperanza, a group of 16 women have met weekly to undertake small projects, provide mutual support and build community. Their projects have included a community garden, raising ducks and guinea pigs for market, furniture building, and installation of water tanks in their homes to ensure 24-hour access to clean water. Another important achievement has been the formation of a formal women’s committee and provision of gender and leadership training to their members. The committee is sharing what they have learned with the larger community and have engaged the nighbourhood’s children in their community development initiatives. The women also continue to improve conditions for themselves and their families. 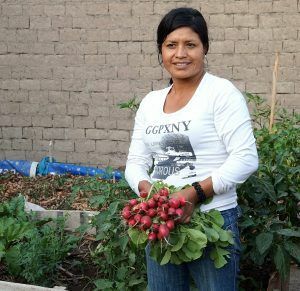 Eight committee members have launched small business initiatives, 12 sell produce grown in the community garden, and 9 have obtained legal titles to their homes. In the wake of the floods that hit the neighbourhood last year, the women’s committee responded to a call by the municipality for projects to help prevent future disasters by submitting a proposal to build a reservoir for runoff underneath their local park.